I went out of my comfort zone a bit for this one but really enjoyed making it. 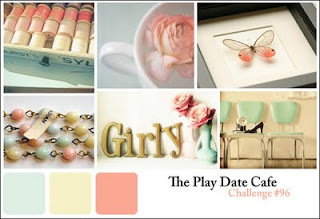 I am putting it in the Play Date Cafe Challenge and Moxie Fab square sketch challenge in Card Ideas week. Cardstock - cream and brown from stash. Paper - Gabrielle collection, Bo Bunny. Stamps - Hero Arts 'Butterfly' and Hero Arts/BasicGrey 'Luscious Ledger' (on butterflies). Ink - Vintage Photo Distress ink, PTI Vintage cream ink, ColorBox Chestnut Roan chalk ink. Other - PTI cream felt, PTI twine, Martha Stewart ivory pearls, EK Success edger punch, MFT Die-namics Mini Rolled Rose. Beautiful! I love your stacked butterflies, really really pretty. I have to confess I have those butterflies but I haven't used them! Must get them out, thanks for the reminder lol. Thanks so much for joining in the fun with us this week over at The Play Date Cafe! It doesn't look out of your comfort zone...it's beautiful! 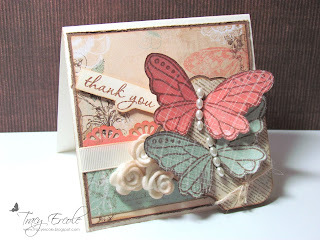 I love the extra touch of the stamp on the butterflies...it all ties together so beautifully with the dsp. Great minds think alike, love your color/sketch combo. This is wonderful Tracy! 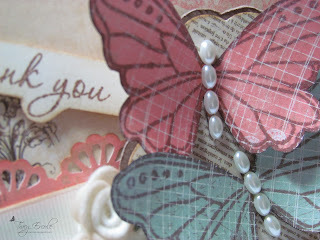 The oval pearls on the butterflies look great! What a beautiful take on the sketch and color story! LOVE all that scrumptious dimension! Thanks so much for playing along with us this week at The Play Date Cafe! Oh, this is sooo beautiful! Fantastic job and execution on your challenges! Woo hoo on your Fab 4! 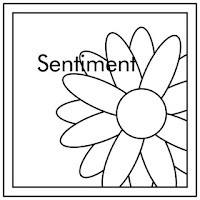 Your card is quite lovely!